Mayor Brian Carlin recognizes retiring public works employee Michael Raymond for his 27 years of service. Director of Public Works Stephen Fazekas presented Raymond with a watch. At the Jan. 10 township council meeting, Mayor Brian Carlin recognized retired public works employee Michael Raymond for his 27 years of service to Burlington Township. Raymond retired Dec. 31. Raymond began his career with public works in 1989 as a laborer and was promoted to a truck driver seven years later. In 1997, Raymond was again promoted to mechanic senior traffic maintenance worker and held that position until his retirement. “Mike played an instrumental role as the mechanic senior traffic maintenance worker,” Carlin said, adding Raymond helped make vehicles in the township safer and more visible. In 1999, Raymond received the Burlington Township Employee of the Year award. He also received the Citizens Service Award for initiative, professionalism and effort. Carlin said Raymond has also received a number of letters of acknowledgement throughout his career. 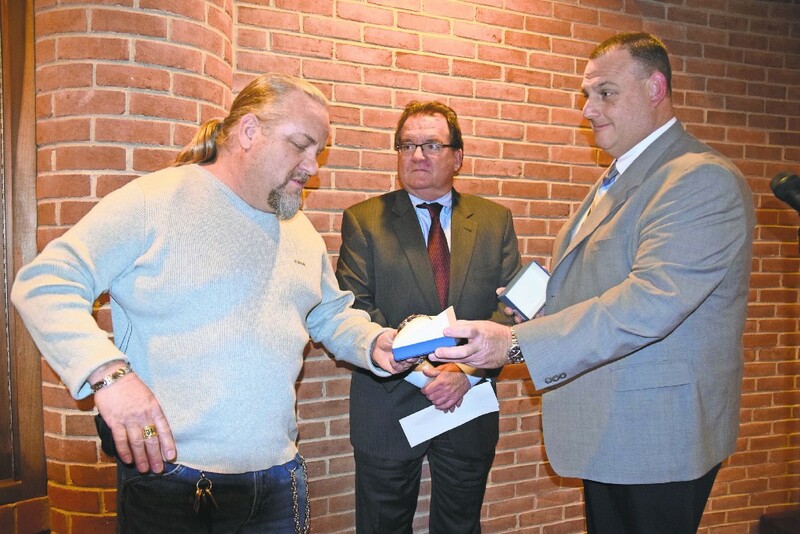 Director of Public Works Stephen Fazekas presented Raymond with a watch to thank him for his service to the township. Councilman Carl Schoenborn, who has been retired for 13 years, gave Raymond some valuable advice. “Keep busy, volunteer, and if you have hobbies, enjoy all of them. I wish you all the luck in the world and health, happiness and prosperity,” Schoenborn said. Council President Joyce Howell thanked Raymond on behalf of council and Burlington Township staff and administration. “Thank you for the wonderful job you’ve done for 27 years, and thank you to your lovely wife for putting up with us,” Howell said with a smile. The next regular township council meeting will be held on Tuesday, Jan. 24 at 7 p.m.